Part of map supplied by William Holmes. I have been studying photo 044 on your web site and the location of this cottage is incorrect. I have lived in Wirkworth since 1946 so I know my way around. 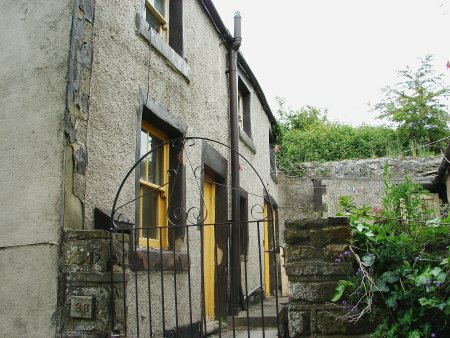 Ferne Bank Cottage is not in Greenhill but at Gorsey Bank. The grid reference is SK2895-5300. When you pass Providence Mill in Gorsey Bank there is a right hand lane to Hob Hall Farm. About 200 yards on the left down a short drive is Ferne Bank Cottage. I have attached a map for its position. I have been visiting the owners of this cottage for nearly 10 years and they confirm the picture on your web site is their cottage. I have enclosed a present day photo and although there is an extension built onto the front, the corner stones are the same. The vertical ridge in the tiles coming down the roof is the same and the window sizes and positions are also the same. I tried to take the present photo from the same position as the old but bushes prevented me moving further to the right. The cottage stands in an old gritstone quarry and part of the back wall abuts the quarry face. Behind the cottage is the hill and some of the trees still exist at the top. In the trees behind the left chimney is another small disused gritstone quarry. 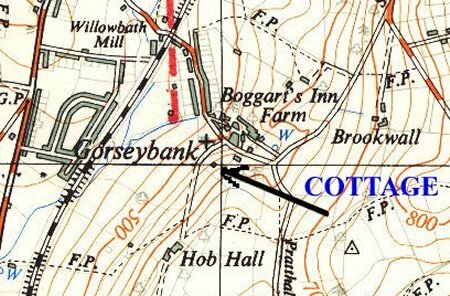 Gorsey Bank is a very old hamlet - it is mentioned In Burdett's map of 1767. I have looked at 86 Greenhill and its size and postion are wrong. 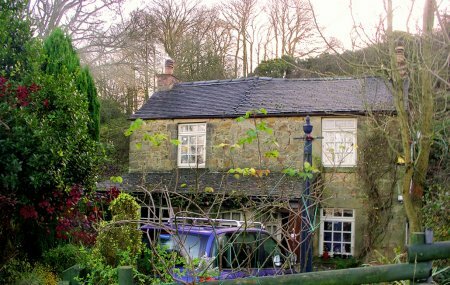 It is also built mostly of limestone - Ferne Bank Cottage is gritstone. Maureen Griffiths has got this one wrong. Incidentally I have been checking my old photo files and in 1997 the present owners borrowed an old original framed photograph of this cottage to be copied so they could have a permanent copy. 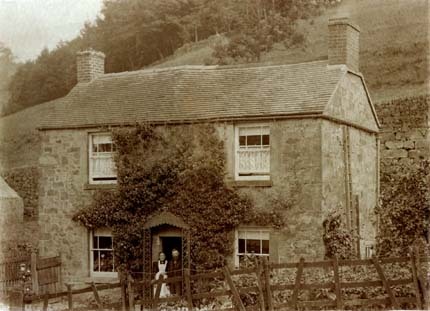 John Woodhouse and Sarah, at Fern Bank Cottage, Greenhill in 1895. John was born in 1845 to William & Sarah of Wirksworth. John Woodhouse and Sarah Robinson married in 1872 at Wirksworth. In 1861 John is shown as a labourer, 1871 a plasterer, 1879 a Plate Layer, 1881 a Railway Labourer, 1891 a Railway Stationary Engine fireman and 1901 a Cow Keeper. He and his family are shown in the Census for 1901, 1891, 1881, 1871, 1861, 1851 and 1841. John WOODHOUSE of Wirksworth said "I work for the London & North Western Railway Company on the CHPR and I was at work yesterday in the Hopton Tunnel.At about 2.15pm William HANDLEY who was near to me in the tunnel near the scaffolding touched me on the chest and said, Keep back, there's Joe Hallows killed; he's knocked all to bits. On that I ran back with him to the outside of the tunnel. I went in again directly and on reaching the place I saw a lump of rock had fallen on to the 3 deceased men. I saw there was no life left in the men and we could not remove the stones without help. William HANDLEY and John COOPER had gone to the quarry and the men from there came up and took the stone off them. From the tunnel mouth to the place where the stone fell was about 30 yards and we had 2 lamps and I and 2 others went up to the scaffold and threw the stone from the truck to the ground and prized the loose stone from the site with a crowbar. I then went down to remove the stones so as to put the scaffold back a bit. The bodies were taken from underneath the stone within 10 minutes and the bodies were crushed. There were 8 of us working in the tunnel but no others were hurt, the portion of the tunnel where we were working is the worst part of it and I believe that a permanent brick arch would have made it stronger. I cannot say whether the deceased were used to this work but they had worked in the quarries. I cannot say if any of them were miners." This was the only view possible of the above, without committing aggravated trespass! 1 The Hillside above the cottage is no longer there, quarried away without trace. 3 The new "side entrance" is down steps, the old photo shows that piece of land sloping down also. 4 The very distinctive ridge of tiles below the chimney stacks is still there, and there are no others like this in the area. This convinces me that not only is it 86,Green hill,(it said so) but also, beyond doubt, Fern Cottage. It took some finding! as it looked nothing like the original, at first.